Science of the Saints, 31-XII-2018 (18 Dec.), The Holy Martyr Sebastian and His Companions. The Holy Martyr Sebastian was born in the city of Narbonum (in Gaul, modern-day France), and he received his education at Mediolanum (now city of Milan in Italy). Under the co-reigning emperors Diocletian and Maximian (284-305) he occupied the position of head of the imperial guards. Saint Sebastian was respected for his authority and with the love of the soldiers and those at court: he was a brave man, filled with wisdom, his word was honest, his judgement just, insightful in advice, faithful in his service and in everything entrusted him. But being himself a secret Christian, he much aided his brethren in the faith. The Christian brothers Marcellinus and Mark had been locked up in prison, and at first they firmly confessed the true faith. But under the influence of the tearful entreaties of the pagan-parents (the father Tranquillinus and mother Marcia), and also their own wives and children, they wavered in their intent to suffer for Christ. Saint Sebastian went to the imperial treasurer, at whose house Marcellinus and Mark were held in confinement, and uttered a rousing speech. Saint Sebastian thus persuaded the brothers to go through with their act of martyrdom. His speech stirred everyone present. They beheld how the very face of the saint did shine like that of an angel, and they saw how seven Angels did attire him radiant garb, and a fair Youth did bless the orator and say: “Always shalt thou be with Me.” The wife of the imperial treasurer Nicostratus, named Zoa, had lost the ability to speak six years previously, and she fell down at the feet of Saint Sebastian, with her gestures imploring him to heal her. The saint made the Sign of the Cross over the woman, and she immediately began to speak and she glorified the Lord Jesus Christ. She said that she had seen an Angel with an open book, from which Saint Sebastian did read his preaching. Thereupon all present came to be believers in the Saviour of the world. Nicostratus removed the chains from Marcellinus and Mark and offered to hide them, but the brothers refused. Mark said: “Let them rend our bodies with cruel torments; they can kill the body, but the soul, warring for the faith, is not to be conquered by them.” Nicostratus and his wife asked for Baptism. 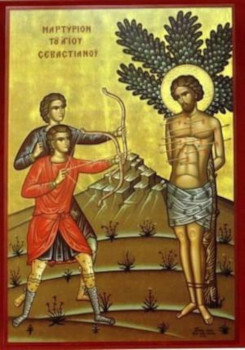 Saint Sebastian advised Nicostratus to arrange matters such, that Baptism might be made over possibly a large number of people. Nicostratus then requested the head of the Roman prison, Claudius, to send to him all the imprisoned. Conversing with the prisoners, Sebastian became convinced that they were all worthy of Baptism, and he summoned the presbyter Polycarp, who prepared them for the mystery with a catechetical talk, he instructed them to fast, having set for evening time the making of the sacrament. During this while Claudius informed Nicostratus, that the Roman eparch named Arestius Chromatus was pressing him for an explanation as to why the prisoners were gathered at his house. Nicostratus told Claudius about the healing of his wife, and Claudius in turn led to Saint Sebastian his own sick sons, Symphorian and Felix. In the evening the priest Polycarp baptised Tranquillinus with his kin and friends, and Nicostratus and all his family, Claudius and his sons, and likewise sixteen condemned prisoners. The newly-baptised numbered 64 in all. During this time the bishop at Rome was Saint Caius (afterwards Pope of Rome from 283-296). Saint Caius gave blessing to Chromatus to go to his estates in Southern Italy together with the presbyter Polycarp. Christians unable to undergo the suffering of martyrdom went with them. The priest Polycarp had been dispatched for strengthening the newly-converted in the faith and for making the sacraments. Tiburtius, the son of Chromatus, desired to accept martyrdom and he remained in Rome with Saint Sebastian. Of those remaining, Saint Caius ordained Tranquillinus to the dignity of presbyter, his sons Marcellinus and Mark were ordained deacons, and there remained also Nicostratus, his wife Zoa and brother Castorius, and Claudius, his son Symphorian and brother Victorinus. They gathered at the court of the emperor together with a secret Christian, the dignitary Castulus, but soon the time began for them to suffer for the faith. The pagans arrested Saint Zoa first, praying at the grave of the Apostle Peter. At the trial she bravely confessed her faith in Christ and she died, hung by her hair over rotting refuse; her body then was thrown into the River Tiber. Appearing in a vision to Saint Sebastian, she told him about her death. Presbyter Tranquillinus was the next after her to suffer: pagans pelted him with stones at the grave of the holy Apostle Peter, and his body was likewise thrown into the Tiber. Saints Nicostratus, Castorius, Claudius, Victorinus, and Symphorian were seized at the riverbank, when they were pulling out the bodies of the martyrs. They led them to the eparch, and the saints refused his command to offer sacrifice to idols. They tied stones to the necks of the martyrs and then drowned them in the sea. The false-Christian Torquatus betrayed Saint Tiburtius. But not gaining a renunciation of Christ from him, the trial-court gave orders to put young Tiburtius on red-hot coals, but the Lord preserved him: Tiburtius walked through the burning coals, not feeling the heat. The torturers then beheaded Saint Tiburtius. Unknown Christians then buried the saint. Saint Sebastian was the final one taken off to torture. The emperor Diocletian personally interrogated him, and persuading himself of the resoluteness of the holy martyr, he ordered him taken out beyond the city, tied to a tree and shot with arrows. The wife of the dignitary Saint Castulus, Irene, went at night in order to bury Saint Sebastian, but found him alive and took him to her home. Saint Sebastian soon recovered from his wounds. Christians urged him to leave Rome, but he refused. Coming nearby a pagan temple, the saint saw the emperors approaching there and he publicly denounced them for their impiety. Diocletian gave orders to remove the holy martyr to the Hippodrome and there execute him. They killed Saint Sebastian, and cast his body upon the rubbish heap. The holy martyr appeared to the Christian Saint Lucina in a dream vision, and bid her take his body and bury it in the catacombs. And thus the pious Christian buried the body of the saint. Next Next post: Science of the Saints, 1-I-2019 (19 Dec.), The Holy Martyr Boniface.